Currimbin coach ackson Maynard (left) in action during the rescue. 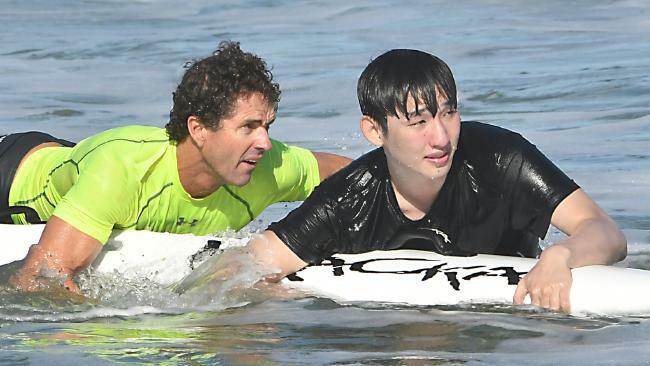 SURF lifesaving competitors lining up for a state title were diverted to a race against time to save four Asian tourists swept out to sea on the Sunshine Coast. The visitors, believed to be from China, were dragged out in a rip in choppy conditions at Maroochydore late yesterday afternoon. They struck trouble swimming outside the flags, but were lucky to be only 20m from hundreds of super-fit lifesavers contesting the 2018 Queensland Surf Life Saving Championships. 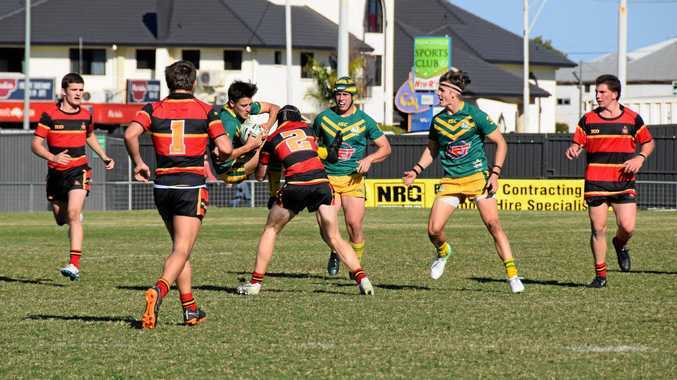 Liam Albertsen and Cooper Miskell rescue one of the Chinese visitors at Maroochydore yesterday during the championships. Cooper Miskell, 18, of Burleigh Heads, said he was lining up for the U19 taplin relay when he answered a call to rescue the stricken swimmers. 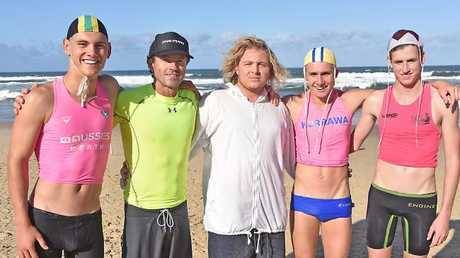 He was joined by fellow competitors Jack Moore, 18, of Northcliffe, and Liam Albertsen, 16, of Kurrawa, as well as Currumbin coach Chris Maynard, who is also the Gold Coast Council's lifeguard superintendent, and Bailey Williams, of Alexandra Headland. The tourists were lucky that the Queensland Surf Life Saving Championships were happening nearby when they ran into trouble. They grabbed boards and sped to the aid of the tourists, who Cooper said were "in a bad way''. "They had their hands in the air waving, were gasping for air and struggling to keep their heads above water. They were fully clothed,'' he said. The patients were brought safely back to shore and did not need further treatment. Surf lifesavers Cooper Miskell (Burleigh Heads Mowbray Park), Chris Maynard (Currumbin), Bailey Williams (Alexandra Headland), Liam Albertsen (Kurrawa) and Jack Moore (Northcliffe) after the rescue. Mr Maynard said he had been watching the surf action and noticed the tourists being dragged into deep water and starting to panic. "As a lifeguard and a lifesaver, you always have eyes on the water, and I could see these people were getting into danger," he said. Surf Life Saving Queensland chief executive John Brennan praised the lifesavers.